Hello friends! Today I am going to make my fourth recipe of my 7 days 7 easy meals for toddlers. 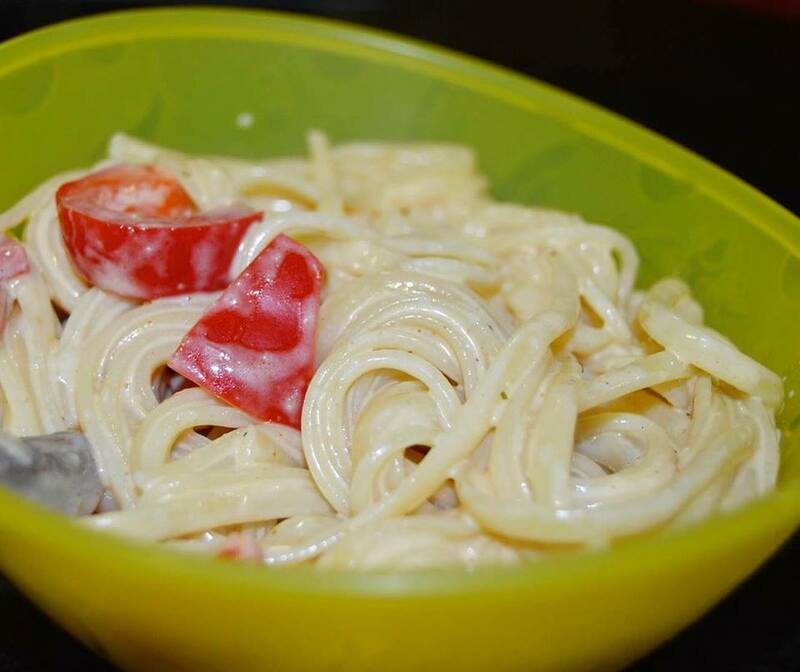 It is a delicious easy recipe of creamy mushroom linguine. Mushroom is a very good vegetable to include in your child diet; they are anti-oxidants and rich in zinc. They lower cholesterol level, support immune system, increase vitamin D level, maintain healthy skin, and contain natural insulin. In addition, red pepper is good for the eyes, maintain a healthy heart, cure anemia, boost immune system, lower bad cholesterol, regulate blood pressure, and prevent hypertension. Tip of the Day: kids need to eat at regular times. Kids’ blood sugar drops fast so when you ignore a meal you will misbehavior and moodiness. The rule of thumb is that a young child needs to eat every three hours, which means three meals, and two snacks spread throughout the day. 1. Cook the pasta in a large saucepan of boiling water until al dente, about 9 minutes, then drains. 2. In a large saucepan add some olive oil, the garlic, the red pepper and the mushrooms. Cook for about 7 minutes on medium heat until the mushrooms become soft and dark then add the cooking cream, parmesan and Italian seasoning, cook stirring constantly for about 5 minutes. 3. Reduce heat to low, add the pasta to the sauce and combine. 4. Serve in a small bowl.